Could We Observe Aliens Mining Asteroids? The question “are we alone?” is certainly a question that captivates everyone, from school children to the general public to astrophysicists, but is often outside the realm of possible science. Not that scientists haven’t tried to find extraterrestrial intelligence: we’ve been looking for radio signals from potential intelligent lifeforms since the 1960s. After 50 years, we still haven’t found any signal that aliens are out there. However, with over 500 exoplanets confirmed to date and thousands more planet candidates, the field of astrobiology and the search for life is quickly moving into the mainstream scientific community. Many authors have written about “biosignatures” in the atmospheres of exoplanets that, if found, would indicate the existence of life (see, for example this review article about exoplanet atmospheres by Seager and Deming). These biosignatures indicate a disequilibrium in the planetary chemistry. For instance, plants on Earth create oxygen that would not otherwise exist in such a high concentration. Measuring chemical disequilibrium could indicate the presence of life forms on a planet. In this new paper, accepted for publication in the International Journal of Astrobiology, Forgan and Elvis take a leap beyond finding these chemical indicators of life: they consider a possible signature of an intelligent, spacefaring life form, more technologically advanced than ourselves. 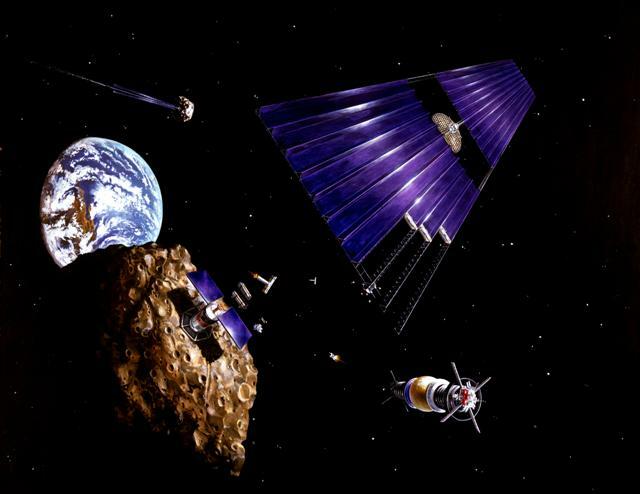 They consider the effects that significant asteroid mining would have on a debris disk and determine whether these effects would be observable. Forgan and Elvis start by explaining the reasons we might expect extraterrestrial intelligent life to start mining their asteroids. Planets have finite resources, and intelligent beings such as ourselves are likely to demand more resources than the planet provides. Spacefaring societies will be likely to start mining additional resources from nearby asteroids; the authors argue that it is likely that humans will start mining asteroids once we have depleted the Earth’s natural resources so significantly that it is economically feasible to do so. Debris disks are disks consisting of pieces of solid material ranging from dust-sized to hundreds of kilometers across. They are controlled by the balance between gravity and radiation pressure; the smallest particles will be blown out of the system because radiation pressure will dominate, pushing them outwards. At the same time, more small particles are created through collisions. The balance between these mechanisms, in steady state, results in a power law particle distribution size of the debris disk. The first potentially observable feature of large-scale asteroid mining is a change in the chemical makeup of the disk. Since the purpose of mining is to remove a large quantity of a specific chemical species, we could look for debris disks that are not in chemical equilibrium with their host stars. To do this, we would need very detailed spectra (lower resolution spectra would have degeneracies, meaning that disks made of different materials would have indistinguishable spectra). The authors note that depletion of a single species could be explained by natural phenomena, but that depletion of several species together would be harder to explain. Another potential feature that we could observe is the change is the particle size distribution that would results from mining. Since mining is a destructive process, it would reduce the number of larger bodies and increase the number of smaller bodies compared to what we would expect from the balance of gravity and radiation pressure. The authors model the effects of various rates of mining and think about various mining strategies that the civilization might adopt. They conclude that very large-scale mining would create a detectable change in the size distribution, but that the same signatures can be mimicked by natural events such as collisions between large bodies. These features alone would therefore not be proof of asteroid mining. Lastly, Forgan and Elvis suggest that mining would change the thermal structure of the disk. The drilling and excavation would throw out dust and heat it significantly. The dust would then cool on timescales of a few minutes. If mining is particularly prolific, there would be variability in the flux at a given wavelength, with fluctuations that correlate with the cooling timescale. They suggest that very high cadence observations would be necessary to detect these variations. Large-scale changes in mining operations, where operations start or stop in mining locations, possibly for political or technological reasons, would introduce a larger variability which could potentially be easier to detect, though it would require many observations of the same target. Forgan and Elvis conclude that while asteroid mining would leave observable signatures in debris disks, this mining would need to be industrial-scale to disrupt a debris disk enough to be detectable. They suggest that anomalous features in debris disks alone would not provide a conclusive detection of extraterrestrial life, but it could give astrobiologists candidates for further investigation. My paradigm just shifted. This is the stuff characters on spaceships were doing in science fiction novels, and now it’s real.